Originally born in Norwalk, Connecticut, USA, Barbara Hocker studied Fibers and Printmaking at Syracuse University and Cranbrook Academy of Art. Her mixed media work fuses the material sensibilities of fiber with computer manipulated photo based prints and abstract monotypes to create works on paper, panels, handmade books, sculptures and installations. 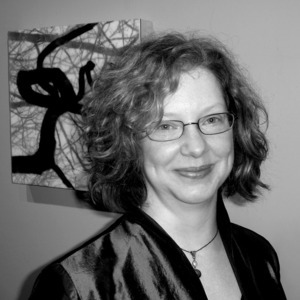 She has exhibited extensively in Boston and Connecticut and currently resides in Coventry, CT with her own personal Muse (otherwise known as her husband Tim) and two very spoiled cats. Artist Statement: I love the woods. I love to sit down on a boulder by a stream and listen to the water flowing and the birds singing. Or to walk a path made vibrant and mysterious by fog. Nature is a spiritual place to me. It is full of wonders, and offers space for contemplation, and a place to just be. There are several places near my home where I tend to go repeatedly and know well. Bolton Notch and Eagleville Reservoir are the most often visited. But each place/time, each walk, is unique. There's weather, time of day, seasons, high water, or low. I bring my camera to try to capture how the woods and the water feel to me on that day. What mood are we in, the woods and I? I discover our mood by wandering along and serendipitously capturing rather random images. Later I choose images to work with simply because they interest me. Sometimes I use images straight from the camera; other times I manipulate the images using photo software - it all depends on the effects I'm looking for with each project. I print images using pigmented inks on rice paper and embed them in beeswax and damar varnish (encaustic medium - one of the oldest painting mediums known). I love beeswax and damar (a tree resin) because they are themselves natural substances and their properties allow me to layer images and play with lightness and translucency. Each piece has at least two layers of images. I have a longstanding interest in Asian aesthetics. I particularly seek the Japanese idea of Wabi-Sabi - a way to find beauty in simplicity, melancholy, and even decay. One of the philosophical tenets of Wabi Sabi is that everything in the world is in the process of either evolving from nothingness into form or devolving from form back into nothingness and it is mostly impossible to tell, and unnecessary to know, which direction any particular thing is going. Each direction encompasses the other in its potentiality. Hope and Loss always dance together in every moment and everything is impermanent, imperfect, and in constant flux. Wabi Sabi values "suchness" - the particular - over the universal. It also emphasizes nature, intimate space, intuition, ambiguity, and serendipity.